Which flowers will be perfect for a wedding? White roses of course! 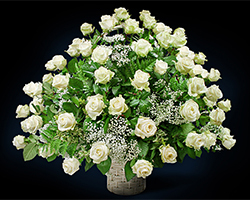 White roses in a basket bring a beautiful message to the newlyweds- I wish for your life tol be all roses. White is a colour always associated with important events- it symbolizes prosperity. Every flower out of as many as 5 in this big basket is like a single wish of endless well-being. Length of roses: 55-70 cm.